Br. Daniel Saulnier, OSB, monk of Solesmes, producer of the new Antiphonale Monasticum for the Latin monastic Office, no longer teaches at the Pontifical Institute of Sacred Music in Rome, effective immediately. He has returned to Solesmes. His remaining lectures this term will be covered by Nino Albarosa. 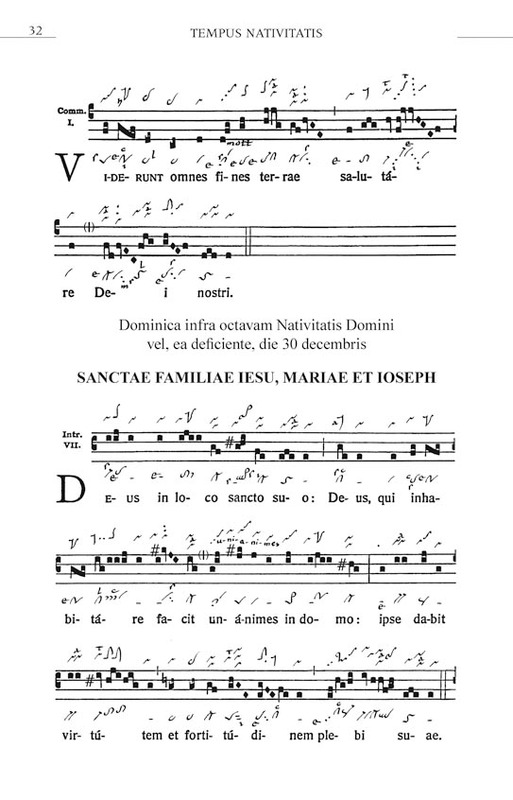 ConBrioVerlag and Libreria Editrice Vaticana are co-publishing a new gradual for Sundays and feasts, entirely with corrected melodies and revised notation. This is an unofficial book in the spirit of Sacrosanctum concilium no. 117, the Vatican II liturgy constitution, which called for an editio magis critica (“more criticial edition”) of all the chant books. A copy of this gradual will be presented to His Holiness, Pope Benedict XVI, on January 25, 2011, and will be available for purchase on January 31. Check out the announcement at the ConBrio website – the sample (below) is Deus in loco sancta suo, page 310 in our Graduale Romanum. But it starts on D in stead of C, and there are C sharps in it! Not your grandfather’s chant. “Proposals for the Restitution of the Melodies of the Graduale Romanum”: Under this title in the journal Beiträge zur Gregorianik (“contributions on Gregorian chant”), the melodies of Sundays and feast days have been published since 1996 in the form of a “more critical edition” (SC 117) on the basis of the oldest (adiastematic [lineless]) manuscripts. On the occasion of the 50th volume of Beiträge zur Gregorianik, a practical complete edition of these proposals for restitution will appear. The new Graduale de Dominicis et Festis is conceived so that the revisions have already been worked into the four-line square-note notation. The neumes of Metz and St. Gall are added above and below this notation. The gradual contains the Mass chants for Sundays and feast days according to the ordering of the Graduale Romanum, i.e., the Ordo Cantus Missae. It is at the service of both contemporary liturgical practice and scholarly work. An indispensable edition that makes the current state of scholarship accessible to chant scholas and their leaders, singers, theologians, teachers, researchers, and all those interested in Gregorian chant, and also responds to the call of the liturgy constitution of the Second Vatican Council. C-sharps in it? To arms! F-sharps too. So much for the B-flat. Sharps? Is that an accommodation for the people who always think they have to do it in the “right” key? Chris, I think it means you should be singing it about a fifth higher. The shape of things to come….? Or should that be the ‘sharp’ of things to come. Whilst not wishing to diminish all of the efforts made by chant scholars, surely one of the advantages of the chant, as we know it, is its universality and general uniformity of interpretation – assuming that the majority of us follow the ‘old’ Solesmes method. I see your point, but continental Europe is in a different place – the scholars and diocesan conservatories and cathedrals have moved almost entirely to semiology and corrected melodies. But religious communities are varied – some semiological, most probably not. For English-speakers Old Solesmes is still pretty dominant, and uncorrected melodies, but there is discernible movement in the European direction as their scholarship makes its way to us. Based on the sample page it would appear that this edition uses the 19th century square notation, which lacks the newer signs developed in the 1934 Antiphonale Monasticum and the 1983 Liber Hymnarius (stropha, oriscus, augmented liquescence, “initio debilis”, etc. )–I wonder why? The Gregor und Taube site uses the newer typography. No one here seems curious about point #1. OK, I’ll bite. Why was Brother Saulnier called home to his abbey? Has any reason been made public?